Chandresh was in my class in Pre-University College, South Bangalore, before I joined my MBBS course. We both had gone to the same coaching class for the Common Entrance Test for professional colleges. He was a very hard-working student and usually topped the class. He also lived in a nearby neighbourhood a couple of kilometres away. We usually travelled together to college or to the coaching institute that year; so we had become good pals during the time. Later he had joined another Medical College in Mysore and I had continued in Bangalore Medical College, so we lost contact with each other. It was nearly six to seven years since we had met or spoken to each other but I recognised him the instant my eyes fell on his trademark goatee, a small tuft of hair below his lips. He was also totally surprised to see me in Chandigarh. (I was on an official tour of the country after joining the IAS). He was gregarious as usual and we chatted for a while exchanging the happenings of the past years. He had joined a Post-Graduate course in Surgery in a prestigious Institute and was in his final year of the MS course. He was thrilled that I had been selected to the IAS and heard the news sometime earlier from a classmate of mine from Bangalore Medical College, who was also in the same Institute. He was appearing for his exams that week and had to appear for a viva-voce the next day. He had come to the city centre to unwind his exam fever, so he left immediately after exchanging mobile phone numbers and promising to keep in touch. I felt that it was a great coincidence that we had stumbled across each other after such a long time and wished him luck for the exams. He planned to start his practice in Bangalore later, so I felt that I would be meeting him soon in future. But I had not expected him to call me the next day. It was noon and I had just finished packing my things for the travel later in the day when I got a call from Chandresh. He was very tense and could barely talk. I understood that something bad must have happened when his voice sounded choked and he was ready to burst into tears. “The examiner is demanding money to pass me,” he told. “Ch ch, these #######”, I thought. I had heard that some Professors who go on exam duty to other colleges had a habit of seeking money from students to pass them but it was a very prestigious college in the country and I did not believe that this was prevalent there also. In such cases, some of the students paid up because they were in danger of failing in spite of giving a good performance in the practical exams and viva-voce which had tremendous scope for discretion to the examiner to play mischief. “Did he ask you directly,” I asked. “What do you want to do?”, I wanted to know what my friend wanted to do in this situation. “He is asking one lakh rupees and I don’t have it,” he expressed his helplessness. I was about to say that I don’t have any money to spare to him for this illegality when he asked can you speak to the Professor and scare him. “You are an IAS officer and if you call him and tell him that I am your friend then he will not pester me,” Chandresh pleaded. Now I was in a bind. Chandresh was obviously in a desperate situation, otherwise he would not have called me. He was hard-working, intelligent and obviously would not perform badly in the exams but now had put a difficult proposition in front of me. He didn’t understand that I was still only a trainee or that I did not or could not wield any such influence. “Why don’t you complain and get him changed,” I suggested. “Nobody would listen to me; there is no time for all that. What should I do? Please tell me,” he again pleaded. He was in a state of panic and I understood that nothing which I told or explained would make his fear go away. “Giving money is out of question. I can only suggest that you lodge a complaint before you appear in front of the man,” I advised. “No,” he started to cry over phone. “I will lose a year, please call him. Let’s see if it works. Don’t ask him to pass me but tell him to be fair with me, that’s all,” he kept pleading with me. His test was in the afternoon and seeing his state of mind I understood that if he goes to the exam in this state of mind anyway he would not perform and fail. “I will ask some seniors regarding this matter,” I assured him and disconnected his call. I was very clear that I cannot do any such thing. I thought of whether I could call his college authorities and tell them of his complaint for further action. “What if he failed, then he would blame me, what to do now! !” I was pondering. I thought whether I would tell him plainly that I cannot do any such help and he had to look after himself. “I will not lift his call,” I finally decided. After some time I got an SMS from Chandresh again pleading with me to talk to the examiner. I felt pity about his situation but was clear in my mind that he should follow the proper channel and not bypass it using me. But it was not the time to explain all this to the poor man, I figured out. If he did not concentrate on his performance then he would surely fail. I was confused as to how to tell my friend not to drag me into this unsavoury incident. The above narrated incident is typical of how people in power like bureaucrats or politicians or Police have to put up with such requests which come to them routinely from people around them; sometimes it would be friends or relatives or even unknown people requesting us to use our official capacities for their personal work. But the fact was that my friend was suffering unjustly and many times we get confused whether we should not be mute spectators to such injustices on weak and innocent people. 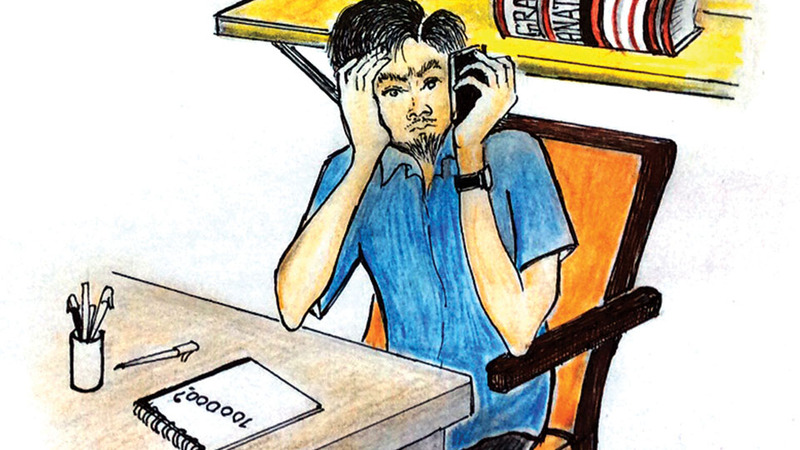 “You don’t worry, you concentrate on the test,” I told Chandresh when he called me again after an hour. I had lied to him; I did not intend to do anything. He had thought that I would help him but I simply did not do anything. But my half-truth had given lots of confidence to him and he went to the test peacefully. That night all of us left for next destination and I soon forgot about Chandresh. After a few days, I saw a few missed calls on my mobile. Chandresh was calling me. Seeing his name I was petrified, he would have failed and was calling me to enquire if I had truly spoken to the Professor or not. I should have clearly told him that I could not help in the matter and he would have thought of some solution himself. Now I felt that I had cheated him. I decided that day that no matter what anyone is requesting I should be clear in saying ‘yes’ or ‘no.’ Half-truths would help no one. Finally, I decided to take his call and apologise. “Hello Ajay, thanks man, I passed,” Chandresh was sounding jubilant. I was happy he had not failed; he had performed well and passed. “No, you have passed on your merit,” I tried to explain to him. But he was in no mood to listen to me. “I will meet you later,” he told and disconnected. I was relieved but had learnt my lesson not to give false assurances to anybody.